On October 1, 1994, oversight of the Presidio transferred from the military to the Golden Gate National Recreation Area (GGNRA). Our newest national park is a mammoth one that covers a significant area in the northwest section of the City. The beauty of the Presidio's creeks, trails, architecture, views, and forests lend themselves more to an ecological compound than a military installation, but reminders of the base's past - it was used as a fort since the first Spanish garrison arrived in 1776 - are everywhere. The majestic San Francisco National Cemetery is the final resting place for 29,000 men and women, including Congressman Phillip Burton, whose legistlation establishment the GGNRA in the early 1970s. 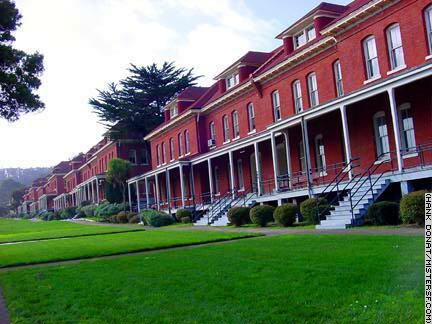 The enlisted men's barracks were built in the 1890s. These buildings and hundreds of others here received landmark status in 1963. The Presidio's lush, misty forests were planted by the Army beginning in the 1883. The ecology trail and Lovers' Lane are highlights along the Presidio's mire of winding roads. By act of Congress, it is incumbent upon the Presidio Trust to turn a profit on the land by 2013. Preservationists caution that excessive development threatens to destroy this exquisite public property.